A review by James E. Person in The Washington Times extolls the “good people” who are the subject of A Senator’s Wife Remembers: From the Great Depression to the Great Society by Henrietta Hill. The memoir by the wife of the late Alabama senator Lister Hill, who served in Congress from 1938 until 1969, was discovered and edited by the Hills’ daughter Henrietta Hubbard. Comprised of a diary and a stash of letters, the book recounts episodes and events from an era in which the rounds of Washington, D.C. political life were marked by a genteel atmosphere. “…this is largely a memoir of a more civil time than our own. Many of the episodes and anecdotes Mrs. Hill records concern social get-togethers in Washington and who was wearing what, with passing references to the events of the day. Distinguished personages cross the stage of the author’s memory, sometimes in passing glances, sometimes in telling detail. F. Scott Fitzgerald, Gen. John J. Pershing and numerous others put in brief appearances and then vanish. Long stretches of Mrs. Hill’s narrative have a dashed-off, letter-to-my-mother feel about them. (In fact, many of the sections of this work were originally letters from Mrs. Hill to her mother.) They are newsy but somewhat dry to the eyes of us outsiders. Person points out that the book details the “long cultural transition” that took place between the landmark events of the title: the Great Depression and the Great Society. The vast cultural changes that occurred during the mid-twentieth century form the background to the society events and minutiae of daily life expounded upon by Mrs. Hill in her diaries and letters. As the Times appreciates, the details serve to inform knowledge of the whole. 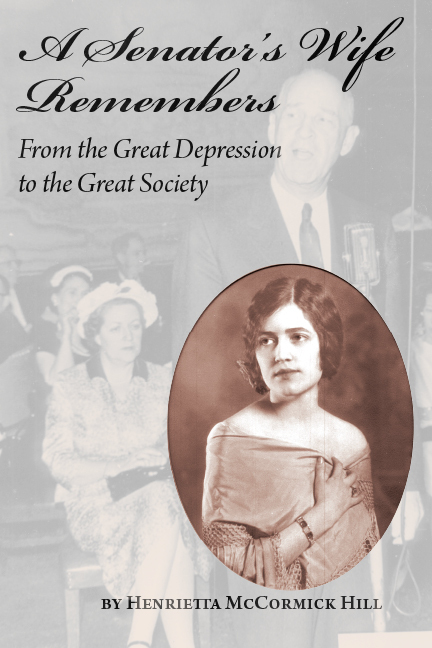 A Senator’s Wife Remembers: From the Great Depression to the Great Society is available from NewSouth Books, Amazon.com, or your favorite retail or online bookseller. You are currently browsing the archives for the Senator’s Wife Remembers category.